Terra Cimmeria, Syrtis Major, Acidalia, Utopia, Daedalia, Kasei Vallis, Pavonis Mons, Elysium: even the names are redolent of mystery, and promise. A thousand years ago, none of these were places, and their world just a red point in the night sky. A hundred years ago, some were patches of light and dark on a blurred disc swimming in the fields of our telescopes. Back then, Mars was a dying planet, irrigated by vast networks of canals built by its ancient and wise (or were they warlike?) natives. Thirty years ago, it had become a dessicated desert, a place of rocky brown wastelands wreathed in the merest whisp of an atmosphere. Today, it is a complex and enigmatic and changing world. In thirty years time, Mars will be a place to be explored by geologists working to uncover its ancient secrets. In a century, perhaps there will be the lights of towns becoming cities scattered across the Martian night. Slowly, but surely, Mars is becoming part of human history. Almost all that we know about Mars, we learned from a handful of spacecraft: Mariner 9 (earlier Mariners flew by Mars, but Mariner 9 entered orbit), the Vikings, Mars Pathfinder, Mars Global Surveyor. Each of these missions has changed the way we see the planet, sometimes in quite fundamental ways. 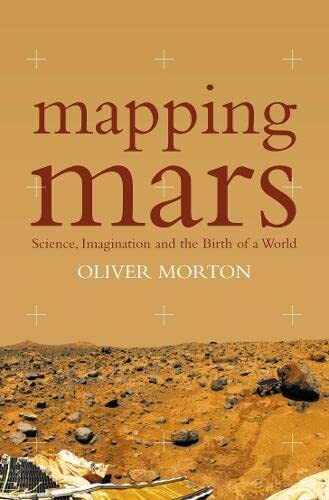 At the centre of these transformations, and at the centre of Oliver Morton’s Mapping Mars (which I’ve just read), is the issue of Martian water. The pictures from Mars Global Surveyor show signs of water everywhere. In the northern lowlands there are features interpreted as several different sets of coastlines. There are features that look like river channels complete with tributaries. Other canyons (many of which begin in collapsed “chaotic” terrains) seem to have been carved by colossal floods that are entirely beyond Earthly experience. Strange layered terrains could well be sedimentary deposits. Morton descibes the development of theories of the water cycle on Mars, a story replete with the periodic formation of oceans in the north, flows of water through the underground “megaregolith”, ice-covered lakes and the cataclysmic draining of aquifers. Choosing between these theories may require fieldwork by geologist-astronauts. Nevertheless, all the evidence points to vast reservoirs of underground permafrost. And there are tantalising hints that perhaps water still sometimes flows across across the surface. Morton is not just writing about the mapping of Mars, but is also mapping Martians. As well as the planetary scientists and engineers involved directly in the exploration of Mars, the airbrush artists of the USGS who produced many beautiful maps of the planet in the days before sophisticated mapping software emerge as unlikely heroes of his story. So, too, do the cadres of the “Martian Underground”, who kept interest the exploration of the planet alive during the long years between the Viking probes and the ill fated Mars Observer mission, and from whose demi-monde the Mars Society has emerged. Nor is Morton’s focus solely on science - he devotes a chapter to recent science fiction about the red planet, including a prolonged discussion of Kim Stanley Robinson’s magisterial Mars Trilogy (Red Mars, Green Mars, Blue Mars). Ultimately, Mapping Mars is about humanity’s relationship with Mars, the ways in which the planet is entering human affairs. It ends with discussions of Robert Zubrin’s ideas about the effects of a Martian frontier on Western civilisation, and with the prospects for terraforming or ecopoiesis. From these seeds, and decades of hard work, and given more than a little luck, one day a New Mars may grow. If you read this beautiful and brilliant book, you’ll want to be part of this greatest and most noble of endeavours. Nice! Sure can't wait until the Mars Global Surveyor snaps a few photos of those possible Ice Towers at the south pole, not to mention what the fleet of probes and landers heading there will find. Unfortunately, only Mars Express (Beagle 2) carries experiments specifically to look for life!